British record shore-caught cod of44lb 8oz back in 1966, and it continues to produce big fish. Give it a try this winter and maybe grab a personal best. Cold Knap Point is a rocky headland that separates the sandy beach by Watchouse Bay on the east side from the pebble beach of the same name on the west side. 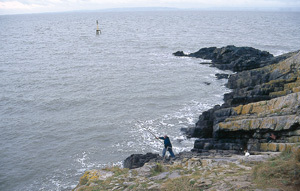 The pebble beach and the rocks provide a variety of fishing throughout the year. Rays, dogfish, conger eels, pouting, whiting, cod, bass and the occasional smoothhound are reported every year. Take Junction 33 off the M4, then the A4232 following signs for Barry. Bypass the town centre to the island by turning west to the Knap. Towards Tom’s Point Tom’s Point, where the British record cod was taken, juts out at the harbour entrance. The ground is relatively clean and good for mullet, flatties and bass in summer. Try light tackle and a float-fished prawn for bass. Use harbour rag for the mullet. Codling, whiting and pouting fall to fish or lug baits in winter. The ground here is mixed but generally snag free on a good cast. Again it is reasonable here for codling and whiting in winter, with flatties and bass in the summer. Can only be fished on the top half of the tide. There’s a good chance of a bigger cod on big spring tides due to the deeper water. 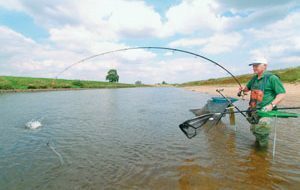 Long-distance casting with rotten bottom set-ups is essential here due to the rough ground close in. A strong current swirls here before rounding the point. A very good big cod or conger spot if you don’t mind losing tackle. Take care and don’t fish on the wet rocks or when the sea is rough. There is a strong lateral current here and the first two hours of the ebb are often good. Distance casting produces rays, especially on a calm summer evening. An excellent spot for big whiting after dark in the autumn, the odd double-figure cod can also show during winter. Take extra care on the slippery pebbles.